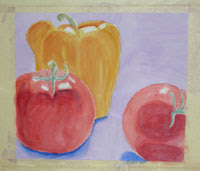 My Wednesday night students have been working on a still life with vegetables in watercolor. We have been having an exceptionally good time in this class and learning a lot about composition, values, washes in large areas, soft and hard edges and more! Left are Dawn and Joe, two of my hard-working students. At right is a painting by a student that is about half-way completed. Tonight was the last night of this six week session. I admire how hard each person works and applies what they learn to each new piece. The next six week session begins May 21st. Can't wait!!! 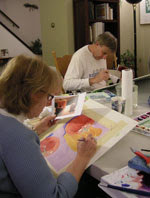 For more information on my classes go to: http://watercolorworksart.com/Classes.